So long, Frank Lloyd Wright: one of his few designs in New York City was demolished. The space behind these papered-over windows at 430 Park Avenue, between 54th and 55th streets contained an interior designed by Frank Lloyd Wright, widely regarded as the greatest American architect of the past century. 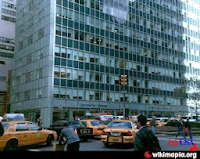 I used to work in 430 Park, when it was a banal 1950s vintage international style building (originally a 1920s vintage apartment building that was stripped of its brick and limestone facade and given a glass and steel front), a poor cousin to the nearby Lever House and Seagram Building. When I began work there, I noticed that the ground floor housed a Mercedes Benz dealership that had a spectacular looking showroom. I later learned that this showroom had been designed by Wright, and had the distinction of being among only four things by him in New York City, the others being the Solomon R. Guggenheim Museum on Fifth Avenue at 89th Street; The Crimson Beech, a prefab house on Staten Island; and a display room at the Metropolitan Museum of Art. Now only these last three remain. 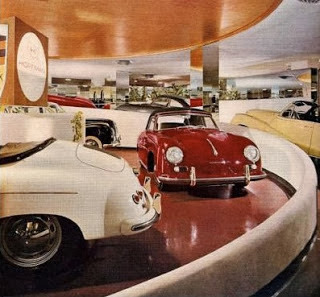 This photo, from Jeremiah's Vanishing New York, depicts the showroom as it was at a time when the dealership sold Porsches as well as Mercedes. To me, the building does look better. The principal change is that the narrow north and south walls, which were previously clad in white brick, now are glass and metal, like the facade facing Park Avenue. 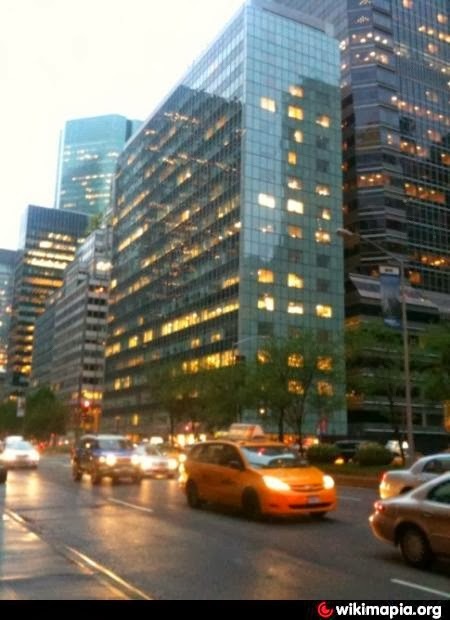 While the long Park Avenue facade still has its pattern of horizontal strips of window alternating with strips of opaque green, the appearance is somehow softer. The overall effect is to make the building look like something inviting to touch, like a hand-held electronic device. The building's owners acted lawfully and within their rights. And, as this New York Times article notes, the showroom wasn't considered one of Wright's more significant works. The article quotes the late, and eminent, Times architecture critic, Ada Louise Huxtable, as calling it "cramped." Still, some saw in its spiral ramp an adumbration of the Guggenheim. I'm very sorry that it's gone. Part of my sorrow is that few seemed to know about it, so I felt I was in on a choice secret. I liked to imagine taking one of my architect friends there and basking in their delighted surprise. In a better world there would have been public funds sufficient and available to compensate the owners for the loss of income, which for a prime Park Avenue commercial space could be substantial, they would suffer from preserving it. Perhaps it could have been acquired, or leased for a long term, and used as a small museum commemorating Wright's life and works. *For some reason, it seems to make economic sense for car dealers to locate in proximity to each other. Maybe the idea is that you get spillover from other dealers' potential customers who didn't like what was offered there. In giving up the Park Avenue location, though, Mercedes abandoned the place where, as reported by one of my fellow lawyers who spotted him, Jerry Seinfeld came to shop for a car. In any event, I can't help but wonder if Mercedes' decision to leave the space wasn't in some way encouraged by the building's new owners. My old Civil Air Patrol buddy Steve Scrivener's name is there, as are those of several soldiers I helped to train during my Fort Polk days. WNYC's website links to an interview with Maya Lin, who designed the memorial. There's also a recollection of the dedication on the same website.